It is interesting to think that a few short years ago prohibition on Marijuana had a strong hold on the Silver State. Today anyone over the age of 21 can legally purchase marijuana in Nevada. You can’t consume it in public but you can consume marijuana at a private residence. It is still illegal to drive under the influence or to purchase Marijuana from an unlicensed source. Working in the marijuana industry in Nevada is as easy as obtaining the proper licensing. There are several great companies to work for as an Agent. Once you are hired, you will complete the Agent application process and receive a temporary license to work in the marijuana industry in Nevada. In 2001, Nevada instituted the Nevada Medical Marijuana Program (NMMP) legalizing the consumption of marijuana for medical purposes. Nevada allowed licenses facilitating this program. Cultivation Facility – is a license to grow, process, and package marijuana. Distributor – is a license allowing transport of marijuana. For example, from a cultivation facility to a retail store. Testing Facility – is a license to test marijuana and marijuana products, including for potency and they also test marijuana for contaminants. Retail Store – is licensed to purchase marijuana from cultivation facilities, product manufacturing facilities, and from other retail stores. Retail stores can sell marijuana and marijuana products to consumers for both medical and recreational consumption. Licensing fees for these establishments vary between $15,000-35,000. There are many reputable licensing firms that facilitate this licensing process as well. We hear nothing but great things about Argentum Partners from our mutual clients. One factor to consider if marijuana is purchased and consumed for medical purposes is maintaining the state’s NMMP user license. Maintaining this NMMP user license will save you an extra 10% excise tax. Purchasing recreational marijuana, from a proper marijuana Retail Store in Nevada, will include an additional retail excise tax on top of the regular 15% excise tax. Under this new tax structure that went into effect July 1, 2017, only cultivators and retail stores will file and pay marijuana taxes. Before July 1, 2017, the Nevada Department of Health and Human Services oversaw the licensing process of the Medical Marijuana Industry. This allowed Fingerprinting Express and other civilian fingerprinting sites to send the fingerprint record via Livescan. When sending fingerprints electronically to the state and FBI the private fingerprinting sites have to collect and pay the background fees. On July 1, 2017, the marijuana licensing process transferred over to the Nevada Department of Taxation. At the time this blog was written in August 2017, the Department of Taxation was not set up for the processing electronic Livescan fingerprints with the state of Nevada. We are currently providing the old fashioned hard fingerprint cards to be manually scanned by the state. Not to worry, Fingerprinting Express does invest in the software and printers to scan your fingerprints digitally and print the fingerprint cards, avoiding the messy ink method. This digital method is not only faster, it is much more accurate than the ink fingerprinting method not to mention the fact that you won’t have black inked fingers! Fingerprinting Express charges nominal fees for this service to work in the Marijuana Industry, and we can also provide the photo required in the application- expeditiously saving your precious time. Applicants must present a valid government issued ID and payment is accepted in cash, credit or debit. 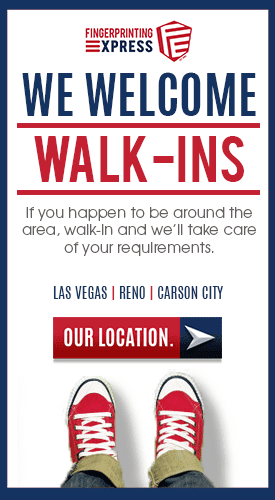 Walkins are always welcome, at any of our locations, or you can easily find a location here. The fingerprinting industry is not as regulated as the marijuana industry. It is important to locate a reputable company when needing to have fingerprints for employment or licensing. Fingerprinting Express takes every measure to protect personal information. Fingerprinting Express provides employer accounts for marijuana establishments that wish to take care of the fingerprint and photo fees for their applicants. We are systematic so that we do not forget to give back important things- like your ID. Fingerprinting Express offer mobile fingerprinting and photo processing for marijuana agents by appointment. With over 14 years of experience and the highest customer service satisfaction ratings in the country for our industry, Fingerprinting Express is the go-to place for fingerprint background checks. Basically, Fingerprinting Express is straight dope! UPDATE 10/20/2017- Fingerprinting Express is now sending fingerprint background checks for the Nevada Marijuana Industry electronically via Livescan. If your agency holds dual licenses for both Medical Marijuana and Recreational Marijuana the Marijuana Agents will have to be fingerprinted twice. Fingerprinting Express offers a bundle discount rate for these background checks and we have the lowest fees in the state of Nevada! Click Here for more information on obtaining a Nevada Marijuana License or you can contact the Department of Taxation Call Center at (866) 962-3707.